. Ice cream is a typical summer refreshments but not only. Beside there is a big consumption of ice cream and gelato during the winter too ice cream is now not anymore a standalone snack. It became part of menu' in prestigious restaurants and often many dishes are already served accompanied by an ice cream. 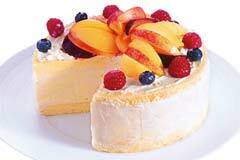 One of the more famous pairing of ice cream dish is to combine it with a dessert. 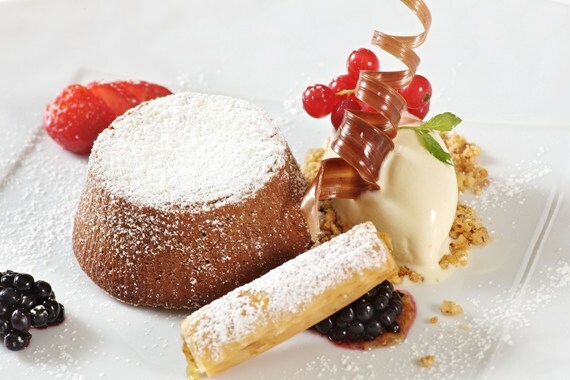 The tortino in Italian or chocolate lava is always served with a vanilla scoop, the affogato al caffe' where ice cream is drowned in fresh coffee and the banana split where fruit is together with ice cream are all good matching for ice cream serving. Fruit together with ice cream is a notorious pairing as strawberry and cherry are standard decorations of ice cream and gelato. So the first tip we can suggest you is chocolate cake with vanilla, fruit ice cream as well as milk ice cream with banana. 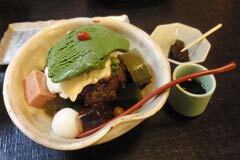 But there are more interesting combinations and ice cream dishes. In this web page we want to try to give some more tips, advices and guide you to more matching of food and ice cream and not only dessert and fruit. 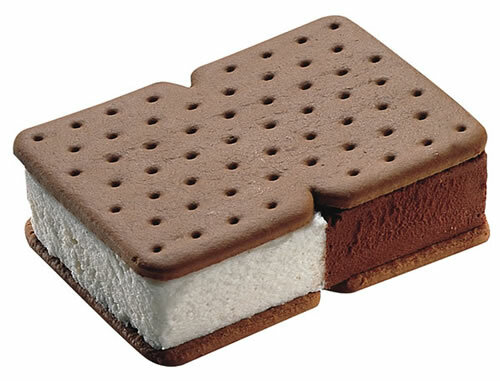 "Icecream" is often uses as dessert in many ways. A simple strawberry can completely change the look of the single scoop ice cream serving, if more and with toppings became a real dessert. Cherries also have them place in gelateria. 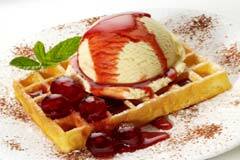 A plain waffle became a supreme dessert with a scoop of gelato. 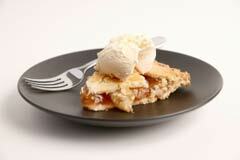 A grandmother homemade cake with a vanilla ice cream on top and some icing sugar around became a modern dessert serving. 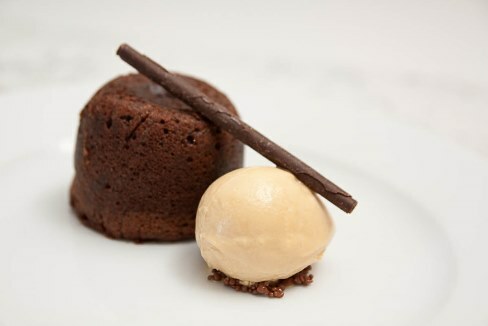 The tortino or chocolate lava, the small chocolate cake that has a liquid hot filling is always accompanied with a scoop of vanilla. Maybe you don't know it but a banana scoop is even better as banana and chocolate really match. try it out as soon. 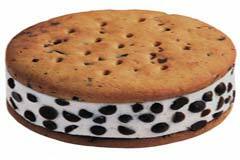 A big round cookie filled with milky flavor ice cream and chocolate chips or an elaborate tiramisu' ice cream cake are both good dessert. 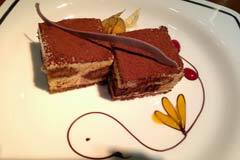 The tiramisu' match the coffee with ice cream and cheese and rum! And the result is delicious. 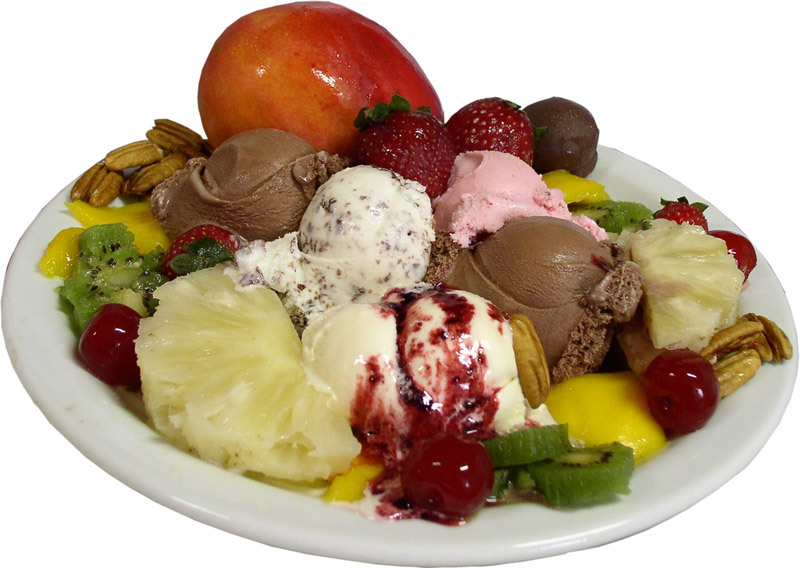 As you can image beside strawberry and cherry and the classic banana (see banana split) you can use virtually any kind of fruit to mix match with gelato: pineapple, kiwi, cantaloupe, orange, lemon, coconuts and so on. 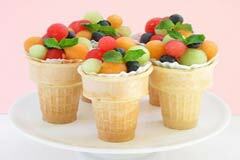 You can cut different kind of fruit in small spherical shape and put it in a classic ice cream cone so you will have a nice colorful cone. Hidden inside the cone a vanilla or a banana scoop as surprise. 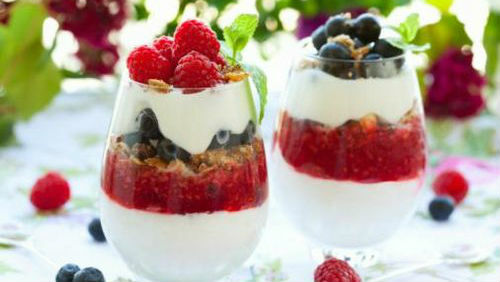 Yogurt ice cream in a glass with various mixed berry will let you obtain a nice gelato combination as the acidity of yogurt match with the strong taste of berries and as gelato sugar and toppings give to the bitter a pleasure combination. 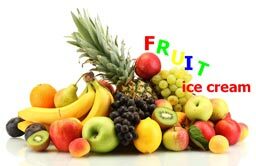 A scenographic effect is to fill fruit of gelato: you can use an orange, a lemon, a whole coconut or you can split pineapple in slices and in the hole put an ice cream of yogurt or green apple. 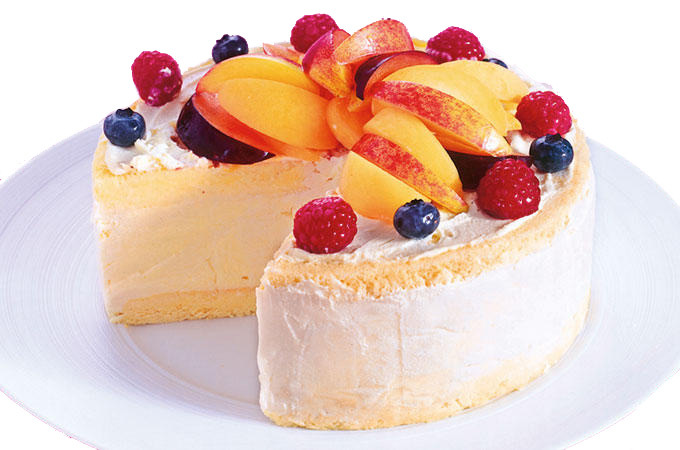 A nice cake with two layer of sponge cake filled with milk ice cream also called fior di latte in Italian or Dolce Latte in our website covered with cut of peach and few berries that match with the milk and the sweetens of the peach mix all together in a good combinations of tastes. 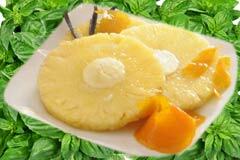 After a dinner with sea food try a “sorbetto al limone” o lemon sherbet or ice cream lemon. You can use also lime gelato. The refreshing feeling will give you a sensation of clean mouth. This is good after fish! 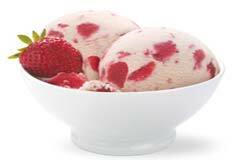 To prepare a menu ice cream keeps in mind also the season. In winter you can abound of milk flavors like Gianduia, hazelnut, dolce latte, zabaglione, white chocolate, chocolate chips and in the summer dedicate more flavors in your menu ice cream to green tea, coconut, strawberry, sherbets and ice cream yogurt gelato in general like yogurt strawberry, yogurt raspberry, yogurt iberry ice cream and more. Also the topping ice cream is important. If you have many children as customer try to consider a price that include topping a buffet so they will have fun submerging the gelato with colored toppings. Also if you have many children consider keeping the temperature at eighteen below ice cream will not melt easy when kids will play with it: put lots of topping, moving all the scoops around to form an ice cream wall and so on, play and then eat it. You can create an ice cream fun club with a fidelity card to accumulate points or just once in a while give a promotion to the card holders and let this offer noted on the ice cream menu. If you use your own ice cream maker do not economize on hazelnut and pistachio gelato ice cream paste: these pastes are expensive and you should also use 100g per kilogram, not 50g. But better not have them in the menu’ than have poor imitations. Yes, ice cream and wine as ice cream and strong drinks together can be done. But you must be 21 years old minimum. Just think about the affogato al caffe', the vanilla ice cream that is drown in to hot coffee. 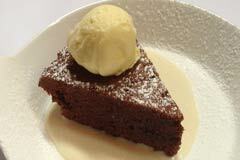 It is enough to add some grappa or other kind of liquor to have the first pair between ice cream or gelato and alcohol. In Italy is common in the summer to have a nice glass of red wine filled with pieces of peach. 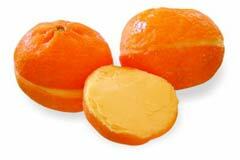 It easy and immediate to think about a peach sherbet to combine with red wine. Just get the sherbet in small spherical parts and drop them in the wine. 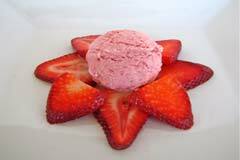 You can also use a strawberry sherbet instead. More exotic a mango sherbet shaped in slices in a glass of white dry wine. Better if wine from Veneto (Italy). You can easily find it in Thailand too. For a blueberry sherbet the idea is to water it with grappa or vodka. Rum raising ice cream with... rum! Also white chocolate with rum. Vanilla and milk flavor ice cream (fiordilatte) with whiskey or hazelnut with amaretto (liquor) or Malvasia (wine). Eventually we could even think about a small production of Pinot Noir sherbet. Waiting for that a lemon sherbet with limoncello or Sauvignon Blanc is also good. For something more sophisticated: raspberry ice cream in a cup with Californian light but dry red wine and some quality dark chocolate topping. 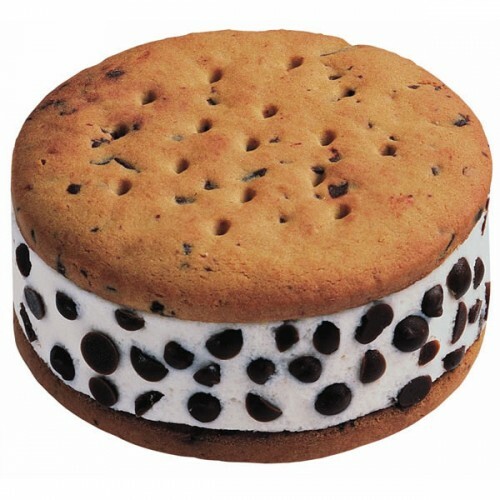 Taxonomy: Food, Beverages & Tobacco > Food Items > Frozen Desserts & Novelties > Ice Cream. Or Food, Beverages & Tobacco > Food Items > Frozen Desserts & Novelties > Frozen Yogurt.